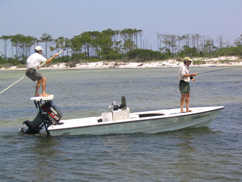 Gulf Breeze Guide Service specializes in fly-fishing the waters of the Gulf of Mexico around Pensacola, Florida. The area is known as Florida’s Emerald Coast because of our sugar-white sandy beaches and emerald green waters. 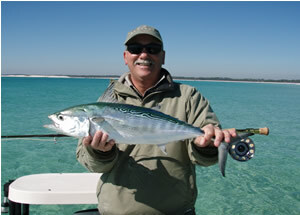 In addition to the Gulf, we fish the diverse waters of Pensacola Bay and the Intracoastal Waterway targeting over fifteen resident and migratory species including redfish, pompano, false albacore, speckled trout, Spanish and king mackerel, bluefish, ladyfish, jack crevalle, amberjacks, mahi mahi, and tarpon. We have fished these waters for over 40 years and use this experience guiding our clients to success. Please click on the "Types of Trips" button for a detailed description of our fly-fishing opportunities. Good casting is the key to success when fly-fishing the salt. We suggest our clients become comfortable casting 50' with 8 weight tackle before booking a trip. To help you "get there" we have teamed up with FFF Certified Casting Instructor Jonas Magnusson who lives in Gulf Breeze. Jonas can teach the basics to beginners and line-accelerating techniques like the "double haul" to advanced beginners and intermediate casters. For clients arriving early, a one-hour tune up the day before our trip can make a big difference. Jonas also guides anglers interested in wade-fishing our local beaches. For more on his services click here. 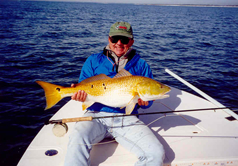 In addition to fly-fishing we offer light tackle inshore/nearshore fishing and offshore "deep sea" fishing trips. Our photo gallery showcases the quality of fish we find both close to shore in calm water and offshore. For those anglers wanting to take fish home, we have arrangements with numerous Pensacola Beach and Gulf Breeze restaurants that will prepare your fresh catch after our day on the water. Of course Capt Baz is always willing to clean enough fish for your group to have for dinner that evening. Our goal is for every guest to have a fabulous experience on the Emerald Coast. We are happy to assist with lodging, transportation, dining, and non-fishing related activities. Follow the links for good descriptions of the waters we fish and the types of trips offered, and be sure to check out our photo gallery. We fish up to 6 anglers from a 21’ Classic Mako center-console “bay boat” or up to 3 anglers from an 18’ Hewes Redfisher flats skiff. Inshore charters are 4 hours ($400) or 6 hours ($500); offshore deep-sea charters are 6hr ($600). Rates are for 1-2 passengers; there is an additional charge of $75 per person over 2.